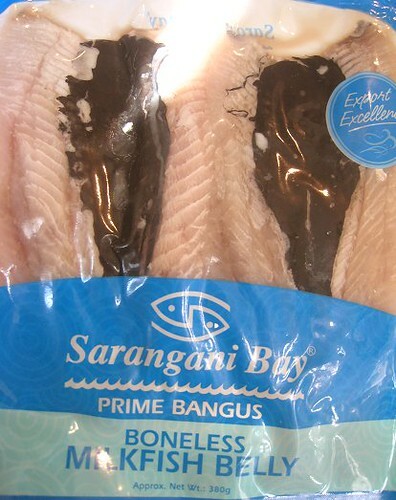 Our Auntie V was kind enough to gift us with several packs of boneless bangus (milkfish) belly from her recent trip to the Philippines. 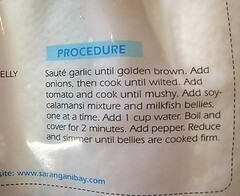 These Sarangani Bay Bangus Belly packs are ultra-convenient -- no mess, no fuss -- and lookee here! 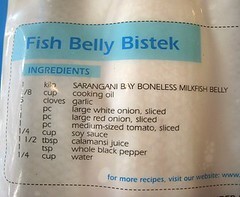 They've even included a recipe at the back of the package: fish belly bistek. Bistek is the classic Filipino dish of beef and caramelized onions flavored with calamansi and soy sauce. This "fish belly bistek" seemed like an easier and no-less-tasty alternative to frying up the bangus belly (for daing na bangus, or "maasim na bangus", as we call it), so we decided to go with it. I proceeded to slice some onions for the dish. After all, this is another entry into this month's edition of Weekend Wokking! We have to make up for the months we missed. I was doing auto-pilot and forgot that I was supposed to slice the onions into rings. What we have instead are half-rings here. I also thawed out some kalamansi purée from the freezer for use in the dish. 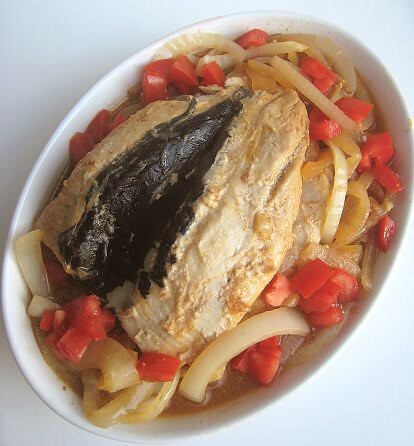 As you may have gathered from reading the recipe on the packet, this dish was really easy to make. We cooked some garlic and half of the sliced onions in oil, until the onions were wilted. We didn't caramelize them like we usually do with our classic beef bistek. Then, the tomatoes went in next. After a minute of cooking, we added soy sauce, calamansi juice, and just the tiniest amount of water. The bangus bellies went in, we boiled the liquid and let the dish simmer. We also added the rest of the onions at this point. Now, it was just waiting for the bellies to cook through. Now, don't be alarmed, but the black portion of the bangus bellies is their fat. Well, actually, it's just a thin membrane covering their fat, which is a white color. Some people love that fish fat part. I chopped one more tomato for garnish and to add a fresher tomato dimension to the dish. 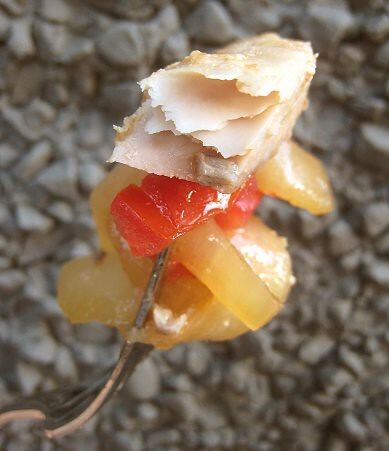 The bangus belly à la bistek was a hit! 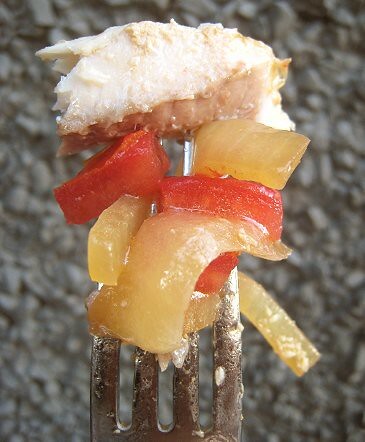 We all loved the sweet onion half-rings, the tender fish, and that unmistakeable scent and flavour of kalamansi. In fact, I think I may prefer bistek made with bangus now, rather than with beef. That intoxicating aroma of calamansi shines through much truer and cleaner here. Also, I found that I didn't need to add any sugar whatsoever to this dish (an ingredient I use when making beef bistek). Actually, I think I just love the combination of onions and calamansi (with a hint of soy sauce). 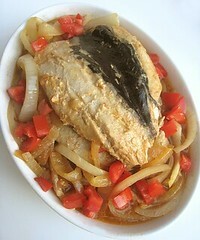 I actually dispensed with eating the bangus most of the time, just loading up my plate with the onions! Thank you, Auntie V, for the bangus bellies filling up our bellies! We still have one more onion dish in mind; hopefully we'll have time to make that one. 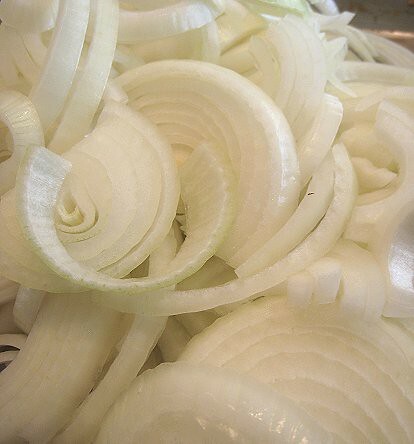 Divide sliced onions into two parts: some onions will be very wilted, while others will retain more "crunch". In a pan or pot, heat oil over medium heat. Sauté garlic until golden brown. 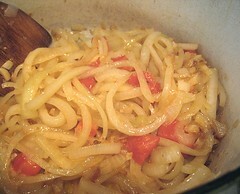 Add one part of the sliced onions and cook until just wilted or until caramelized, your choice. Add the tomato and cook for about a minute. Add soy sauce, calamansi juice and water. Add the bangus bellies and the remaining onions. Bring mixture to a boil and reduce heat. 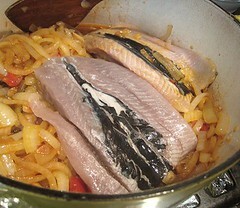 Cover the pot and simmer until the fish is cooked through. Adjust seasoning (salt and pepper). 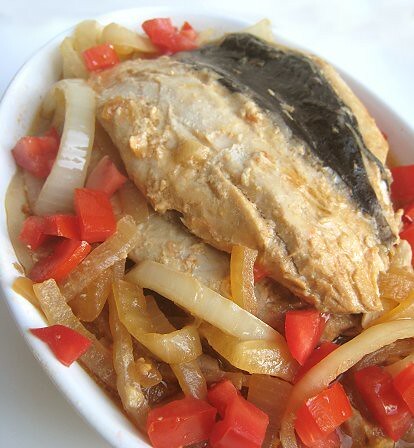 **Feel free to substitute the bangus with another type of fish, preferably a fatty fish like mackerel or sardines. The host this month is Christine of Kits Chow. i like posts where i have to google almost every word in post title! LOL. jonny and i are really starting to just get into filipino food. found a great place in the city and are going to try our hand at a few things soon. this looks so healthy and FLAVORFUL. I love bangus belly. I wonder if you know of any Pinoy store in Vancouver/Richmond that sells them. Thanks. This dish sounds so intriguing. I think it is the calamansi combo with tomatoes, soy and onions that I love. Hey, how about using it for a pasta sauce! 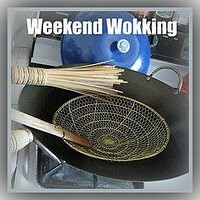 Thanks for participating in Weekend Wokking. Haha. I try to provide Engli9sh translations as best I can. =) That's great; we ourselves have actually much to learn about Filipino food as well. Thanks for visiting! Actually, most Filipino stores/convenience stores have them available. They are sold frozen/displayed at the frozen food section. In Richmond, they are available at Dollar$mart, Tindahan Grocery... In Vancouver, they're available at "Tuloy Po Kayo" (which is actually 71 Food Mart, on Granviulle St & 71st Ave). I'm sure they are also available at the Filipino stores on Fraser (or that area). This dish is totally more than the sum of its parts. Hi TS, thanks for your reply. I will try Tindahan grocery. BTW, I always visit your blog. It just that I haven't had a chance to leave a comment until now. Thanks again. My mum has made this for me before.. She refuses to show me how to make it to keep me coming back for more.. now I know how! Thanks so much!! I made some Sari Sari the other day, very similar to this dish, check me out! Haha, that's funny, your mom keeping the recipe a secret. I've never heard of sari sari before! Will take a look. Yeah... I eat some of eat but it's still not my favorite part. =) Our sister-in-law loves it, though!